LEDGlow’s Million Color Golf Cart Wheel Well Lighting Add-On Kit illuminates the wheels of your golf cart with (4) 12” flexible tubes that are easily connected to the junction box of your existing underglow light kit. 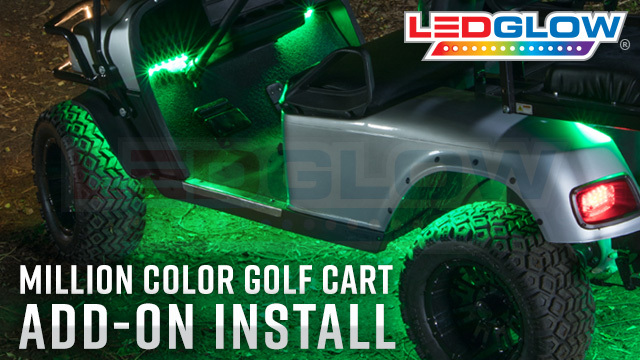 Transform your golf cart with LEDGlow’s Million Color LED Golf Cart Wheel Well Add-On Lights Kit, an ideal supplement to the Expandable Million Color LED Golf Cart Underbody Kit! The light kit will illuminate the wheels of your golf cart with 48 ultra-bright SMD LEDs housed in (4) 12” flexible tubes that are installed to the wheel well liner. Each tube plugs directly into the 12 port junction box included with the underbody kit. It’s that easy! LEDGlow’s Wheel Well Add-On Lights Kit includes (4) 12” tubes, as well as components necessary for installation, such as 3M Tape, screws, zip ties and installation instructions. Note: This wheel well add-on lighting kit is only compatible with the current generation Million Color LED Golf Cart Underbody Lighting Kit (LU-GC-M40.1). thought about going for cheaper stuff glad i bought these. I bought the light kit for my golf cart. Which is amazing. Then i bought both add ons. Which make the whole kit come together. I cant get anywhere on golf cart while camping bcuz everyone stopping me to ask about these lights. If you're thinking about buying these lights. Buy them you wont be disappointed. P.S. I have never wrote a review about any other product i have purchased before. Thats how good these are. Bought this light kit with the addons. Best light kit for golf carts by far. Bright, awesome patterns and easy install. Cant beat their products!! I love the lights they arrived here fast.